This article details how multiple Shopify stores can be synced together through Stock&Buy. This article outlines the setup instructions you need to follow in order to integrate multiple Shopify stores and have them share the same inventory data through Stock&Buy. How does the sync work? When you integrate a Shopify store with Stock&Buy and import your products, the system will automatically link existing products within Stock&Buy with their counter part in Shopify. Stock&Buy uses either the product name or the product variant SKU as a reference to identify similar products. This is the default link mode. When importing products from Shopify, Stock&Buy uses the product name to identify similar products on different stores and link them together by default. In this mode, Stock&Buy links products by name and product variations by their option values. If you would like the system to identify similar products by their SKUs then please set your store to not sync language specific properties such as the product name, description, tags and product types (language sensible attributes). This informs Stock&Buy that common products across your stores might have different names and the SKU should be used to link them instead. More on language sensible attributes in the Shopify installation guide. Note that in this mode, Stock&Buy will not update your product language specific attributes. For example, changing your product name or description within Stock&Buy will have no impact on your Shopify products. Please contact us if you would like to keep your product language specific attributes in sync while linking products by SKU. It is quite common to have multiple Shopify stores in different languages. For example, you could have a .no store targeting Norwegian customers and an .com store for international sales. Stock&Buy allows you to run such stores while keeping your products stock level in sync. 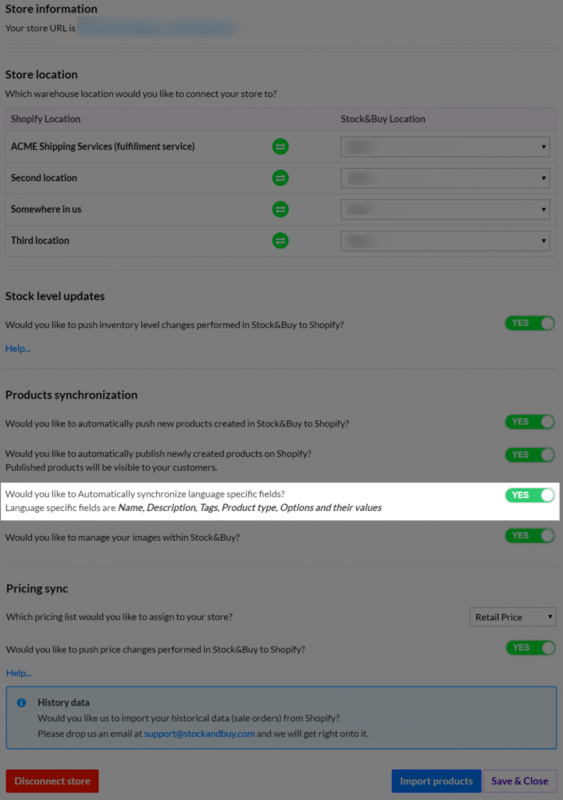 As described in the Shopify Sync Guide document, changes to your products and their stock levels will automatically propagate to your connected Shopify stores. It is therefore important to turn language sensible attributes sync off. This instructs Stock&Buy to not update the product name, description, tags, product type, product options and their values. When operating multiple stores in different languages, it is critical to have all product SKUs properly set. Similar products on different stores must have similar SKUs so Stock&Buy can recognize them as being the same. Before any products are imported, Stock&Buy performs a check and ensures no duplicate SKUs are present. The product import operation will be interrupted should Stock&Buy find duplicate SKUs. Let’s assume you have two stores you want to integrate with Stock&Buy. A German and a Spanish store. The German store is in German, the Spanish one in Spanish. Let’s now assume the team operating Stock&Buy is more comfortable working in German. In this case, you should install the German store first so product names and descriptions would be in German within Stock&Buy. The Spanish store should be installed after the German store so product names and descriptions in Stock&Buy are left intact. In this case, you should set the Spanish store to not sync language specific fields to avoid Stock&Buy pushing product name, description, tags in German to the Spanish store. This section outlines the setup instructions for integrating multiple Shopify stores to Stock&Buy. Stock&Buy has native support for multiple currencies and can handle a wide range of them. Stock&Buy stores prices in the base currency defined under your Account settings. The system automatically converts prices in foreign currencies to the base currency when stored (this will be illustrated in an example below). The stored prices will be converted back to their original foreign currency when pushed back to Shopify. When you install a store which has a currency other than your base currency, Stock&Buy will automatically display a new settings section to configure your currency conversion rate. 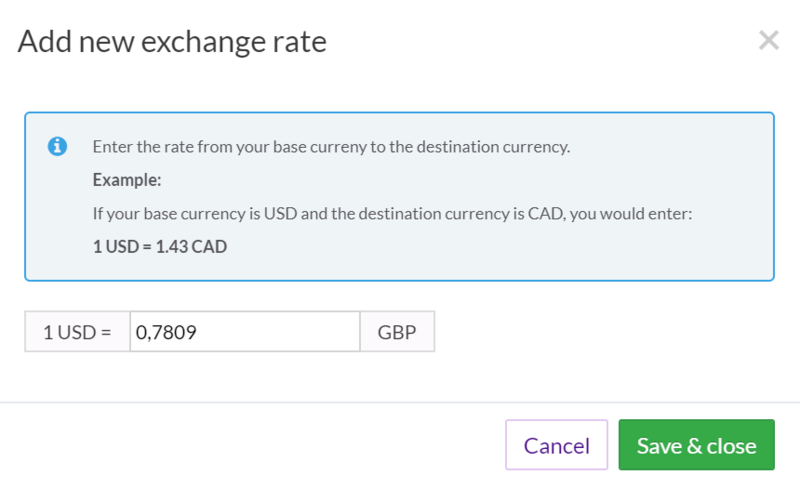 Click the Setup Exchange Rate button to define an exchange rate to be used to convert your prices to your base currency. Once the exchange rate is set and the other settings configured, import your products so Stock&Buy can recognize your products from the installed store. The product prices will be stored in Stock&Buy in your base currency. Let’s assume your Stock&Buy base currency is to USD. You would like to install a Shopify store based in the UK. Your UK store currency is set to GBP. Let’s now assume that the exchange rate is defined as 1 USD = 0.7809 GBP. Let’s assume you sell widgets on our UK Shopify store for 10 GBP . When the widgets are imported into Stock&Buy, their price will show as $12.805, that is 10 GBP / 0.7809. Meticulously designed in Oslo, Norway. The land of Vikings and trolls.